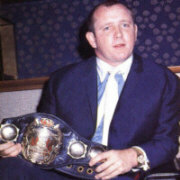 Funk held the NWA title for the entire year of 1970 and faced almost the entire roster of main event talent in cities all over the Carolinas and Virginia. While this list for 1970 is close to complete, we believe we are missing a few title matches. If you have information on an NWA title match we don't have listed here, please let us know at the Mid-Atlantic Gateway.